More SEO! More SEM! More Social! More competitor analysis! Visibility’s simplest domain analysis shows all important values and charts that you will need for an initial assessment. Essentials’ domain overview includes the most important rankings, a directory and subdomain analysis, competitors and even a graphical overview of the keyword distribution across search results subpages. 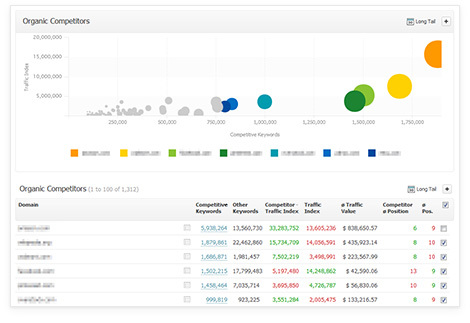 The unique ability to make a direct comparison with your competitors offers an unparalleled depth of analysis. Searchmetrics Essentials allows you to identify which organic search terms will boost results and you will even be able to discover which AdWords they have been using to drive more visitors to their website. 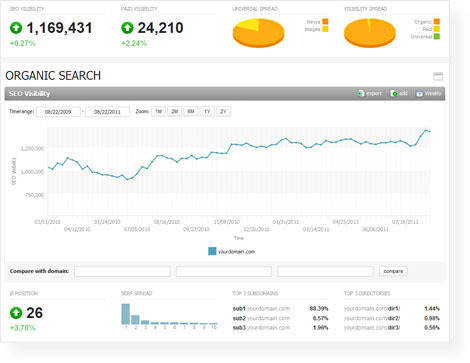 Plus: the competitor overview shows all real competitors in organic and paid search allowing you to quickly identify where to focus for maximum return.